Twitter parties are my thanggg! As a SAHM, I am socially isolated. I have learned to accept, more precisely, depend on my computer and cell phone to get me through the day. If I can't go out and party with people, at least I can do it at home, and I get to talk about my favorite things....beauty products, clothes.... PLUS, I have won lots of amazing beauty products by just chatting with random beauty brands. Recently, I tweeted at the Moroccan Oil Twitter party celebrating the launch of the Moroccan Oil Dry Shampoo in the UK. Moroccan Oil so kindly sent me their first dry shampoo, which turns out it is an argan-infused heaven in a bottle. It smells sooooo good, like a light vanilla and hint of argan's nuttiness, and lingers throughout the day...Ughhh soooo good. ::droolinggg:: I have tried every single drugstore dry shampoo - not going to name any names, but I have not been satisfied with either the blendability, oil reduction, smell, texture. etc. of any single one. I love that it has argan oil, so I know not only are my oily roots being attended to, my hair is getting nourished at the same time! You know how those other dry shampoos feel like hairspray, and you wonder, 'Is this good for me?'.... Well, this one is! 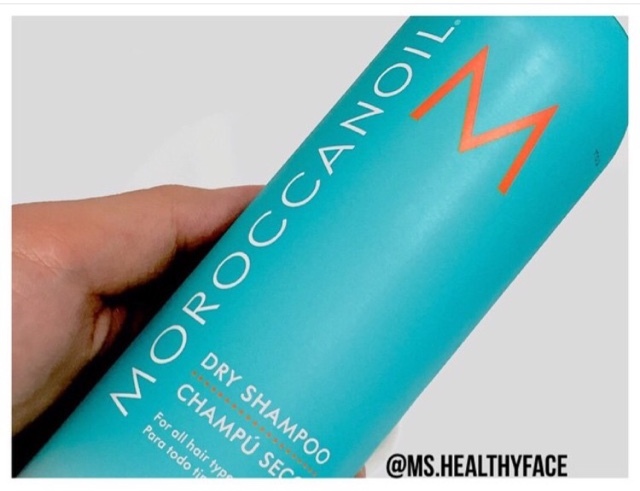 The key ingredients to Moroccan Oil's dry shampoo is rice starch and, of course, argan oil. It comes in two varieties -- a Light tones, and Dark tones. I was sent the light tones on accident, but the rice starch is ultra-fine and blended into my hair easily. The Light Tones formula contains subtle violet undertones to help balance brassiness and bring out the best in light tones. I like to apply dry shampoo in sections: first, down my natural part, then ever two or three inches until I cover my whole crown making sure to cover the base of my crown, then, right under that bump on the back of my head. I also really try to spray the bottle 5-6 inches away from my head per the directions. Then, I massage everything into my scalp like I am actually lathering in the shower. Then I brush it through. No white residue, or oil, and smells amazing. I am obsessed!! Lastly, I love how affordable the dry shampoo -- $10.50!! It is also available in travel sizes, so you can take it on the go! Available via moroccanoil.com, and hopefully soon at the secret mom clubhouses, aka Target and CVS! What's your holy grail dry shampoo?